swisslet: come on! UGH! COME ON! come on! UGH! COME ON! 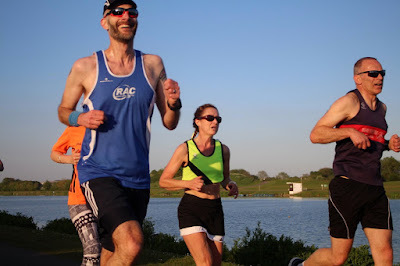 Somewhat unexpectedly, I've been very much enjoying running in the Summer League races. As the name implies, this is a series of races that take place on Wednesday nights across June, July and August around Nottinghamshire. They're free to run: all you need is your running club vest. The prospect of running a 5 mile race with some of the fastest runners in the county sounds awful, doesn't it? I trundle around in something like 40-minutes, but the winners are more than ten minutes faster than that. But running clubs have changed massively, and now the field includes runners who are finishing a good half hour behind me too and I'm comfortably above halfway. I have a little voice that whispers to me all the time that I'm not a fast enough runner to be a member of a proper running club... but I've decided to not let that voice stop me doing something that I enjoy. Anyway. Last week's run was up at Worksop College and the course was in Sherwood Forest. It was a lovely setting and a gorgeous, sunny evening. For all that I think that I've been getting slower and slower over the last few months, when I put my mind to it, I'm actually running pretty much as fast as I ever have, and my average pace over this course was something around 7:50 miles sustained over 5 miles. I'm not going to win, but it's nice to open up the throttle and see that there's still something there. As you would expect, you end up running with people who are around and about the same pace, and there are always a few people who you seem to be in-and-around for the whole race; sometimes pulling ahead and sometimes falling behind. In this race, I quickly became aware that I was running with a woman who was a grunter. I'm a relatively silent runner, but everyone is different... C. runs with a very definite double-huff for every step she takes as she controls her breathing to try and keep the asthma at bay. Whatever works, right? This lady was making an extraordinary noise, grunting and shouting at herself:"Ugh. Ugh. Come on! Ugh. COME ON!" Each to their own, but this was mildly distracting. Still, she was running at the same pace as me, so who am I to criticise? "I prefer to talk to myself"
I was so surprised, it took a moment to register that yes, she had in fact just said that to me.. and by then I was powering ahead, leaving this miserable cow in my dust. Charming though, right? Although, whenever I tell this story to other runners, they seem to all know exactly who I mean. What a way to find local celebrity. I bet she's fun at parties. Not that runners go to many parties. ...and if they do, they're not drinking much because they have a long run in the morning. But, yeah, some runners are fun at parties.